A QUALITY PRODUCT designed to enable users to move a variety of items with ease and reliability. ROLL-OR-KARI has been helping people move since 1941. When you buy a ROLL-OR-KARI you get a full set of two dollies and four web straps... ready to go... ready to do the job. Rubber and felt cushioning afford complete protection at vital spots against marring of fine finishes. Adjustable straps lock around the product securely. 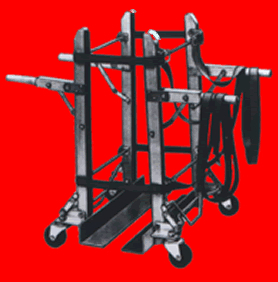 Retractable wheels allow instruments to rest on its own weight while in transport to avoid skidding or rolling. These features are unique with ROLL-OR-KARI trucks.